A frantic ball of energy with a superb work-rate, Healy has profited from the leadership of experienced campaigners Ollie le Roux, CJ van der Linde and Stan Wright at Leinster to become a dynamic part of the Ireland set-up. First called in to the Ireland squad by Eddie O'Sullivan in 2008, Healy failed to win a cap during the Six Nations but got a taste of the international stage, one that continued with inclusion in various Ireland 'A' squads. Healy had a notable 2009, winning the Heineken Cup with Leinster before featuring for Ireland 'A' during their successful assault on the Churchill Cup crown that culminated with a 49-22 final rout of the England Saxons. That triumph was supervised by Ireland coach Declan Kidney and he later drafted Healy into the senior squad for the end of year internationals. Healy made his debut against Australia at Croke Park and quickly cemented his place in the side. 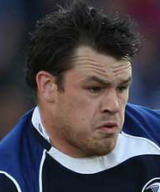 In 2011, Healy signed a new two-year contract extension with Irish Rugby Football Union that will see him feature for Leinster and Ireland until at least 2013. Healy impressed in the 2011 Heineken Cup final where Leinster won an epic clash with Northampton Saints. He was named in Ireland's World Cup squad and was at the forefront of their demolition of the Australia scrum in their pool win over the Wallabies. However Ireland's campaign ended in the quarter finals against Wales. Healy returned to Leinster where he played a central role in leading them into the last eight of the Heineken Cup. He again took his place in the Ireland front row for the Six Nations tournament but the Irish struggled and their scrum endured a traumatic end to the tournament when they were destroyed by England at Twickenham. The following season, Healy's Six Nations campaign with Ireland was overshadowed by a stamping incident that saw him banned for three weeks. However, he was named on the shortlist for the Irish player of the year award and he earned a call up to the British & Irish Lions squad to tour Australia in the summer.